building and maintaining all types of websites for customers across the nation. 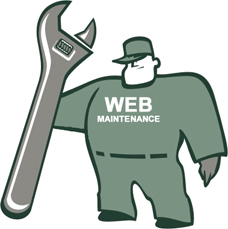 Regular web site maintenance is necessary for any website in order to stay current and secure, and with content additions you'll be more noticed by search engines like Google. Since it's important for visibility to stay up to date on your content and software, it's not an easy task for the typical business owner unless they have web publishing, coding experience, and even server administration experience. Our SEO and Web site Maintenance Service is a cost effective solution that's handled by experienced web programmers that will give your website the attention it needs. Most maintenance we do is done the same day. Whether you need basic updates, a completely new site or have a complex system update, we have you covered. Let our experts monitor your site and make changes that improve your site performance for better search engine recognition, faster download, more signups, increased leads and sales, automated business processes. We use Google Analytics and Webmaster Tools among other methods to examine your page visits, site performance, and make adjustments based on this data to improve position in search results. Additionally, we keep your Drupal or Wordpress software up to date! This is critical to maintain the health of your site, and is the most common problem we see since hackers primarily exploit vulnerabilities in older versions of your Drupal and Wordpress software. We also implement updates that you email, phone, or fax us, on an hourly basis. You can email us your updates directly here using our online form, or send email to sales@bravoweb.com. We'll reply with a link for your review once we've completed your updates. If you need to talk to us, just call 1-888-77-BRAVO during normal business hours and tell us your web site maintenance or SEO needs!